WWE SmackDown Results (4/9): New Tag Team Champions Crowned, The Man Meets Her Match, More! 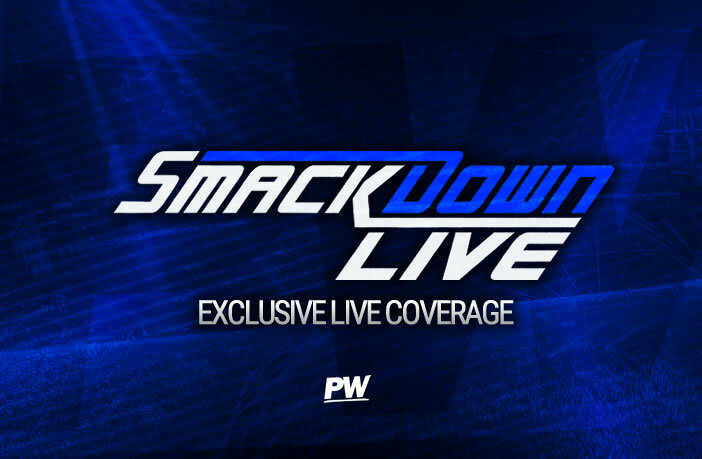 We are kicking off tonight’s WWE SmackDown Live with a huge celebration for Kofi Kingston becoming the new WWE Champion. We have tons of pancakes stacked around the ringside area and a huge rainbow of balloons with the WWE Universe firmly being behind The New Day member. Big E starts things off, saying that he isn’t sure if people have heard, but a man who made millions of WWE fans cry tears of joy, who is clearly an A+ player (with extra credit), Kofi Kingston became the new WWE Champion! He continued that last night they tried to make history on Raw just like Becky Lynch, but whilst that was fun, there is nothing like being home on the blue brand. Big E says tonight is not about the usual New Day nonsense, but tonight is the most important celebration. Xavier Woods says we are here tonight to celebrate the career of Kofi Kingston. He adds that being able to watch his career has been incredible, and that when he met Kofi it was like meeting one of his heroes. E adds that they came together in an effort to reshape culture and change history, and on Sunday that is exactly what Kofi did, Woods and Big E then congratulate Kofi. Kingston says he is at a loss for words, as this is an impossible moment that wasn’t in the script, yet here we are! Kofi gives a special shout out to his family, he says they inspire him to be the best possible role model he can be and he loves them so much. However, that heartfelt moment is spoiled as The Bar arrives, for a second night in a row. Sheamus says he owes them a big thank you for saving him last night, as without them Seth Rollins would have his WWE Championship. Cesaro says he wants a six-man tag team match against them and a friend who happens to be…Drew McIntyre! In our first match of the night there is six-man tag team action which starts with Shinsuke Nakamura and Ricochet going back and forth, with the NXT Superstar coming out on top of the first exchange with a big dropkick. Nakamura gets his team back in control with a spinning kick though as Rusev enters the fray for the first time, immediately using his power to dominate Ricochet as Andrade joins the match and hits a running kick. The heels continue to dominate, but Ricochet finally makes the tag to Ali who manages to get Rusev into their own corner as the three men start to work down on Rusev. As we return from commercial it is Rusev who is in control with a tight bear hug locked in to Ali, who he then flattens with a big clothesline before taking out both of his partners on the ring apron, denying Ali any possible tag. Eventually both Black and Andrade tag in and the two men quickly exchange some quick strikes with Black getting the best of the situation with a moonsault from the second rope, but both of Andrade’s partners stop the pinfall. Ricochet then takes to the skies to take out both of them, running and diving from barricade, however, Nakamura then takes out Ricochet but gets rocked with a Black Mass. As we get back to the ring, Zelina Vega looks to distract Black, however it doesn’t work as Ali eventually tags in and hits the 054 to get the win for his team. However, Ali doesn’t get much time to celebrate as Randy Orton appears out of nowhere and gets rocked by an RKO as he walks to the back and mocks the WWE lighting by pretending to be blinded, like fans were during his match. The run-ins aren’t over though, as Kevin Owens appears out of nowhere and takes out Rusev with a stunner. The Usos are interviewed backstage ahead of their Tag Team Title match, with Jimmy saying that WrestleMania came and went, but they are still the champions, however, they need to win as they have never faced the Hardy Boyz. They then add that it’s not just about the titles, it’s about proving who the best brothers are, in fact, it’s about proving who the best tag team in history is.